Henry Redman | The Phoenix If the men’s basketball team makes the NCAA Tournament, both the team and the school would benefit from the exposure. The arrow is pointing up for Loyola, and not just for the the men’s basketball team, but for the school as a whole. For the past two years, Loyola has been named a top-100 university in the country by U.S. News and World Report, and by all signs has every intention of continuing to move up that list. All you have to do is look at Loyola’s list of “aspirational peers,” a list of schools Loyola wants to be compared to. Loyola’s current peers include other Jesuit schools in the midwest such as Marquette University and Creighton University. Its aspirational peers are telling about Loyola’s hopes — Case Western Reserve University, University of Notre Dame and Georgetown University are some of the schools on the list. 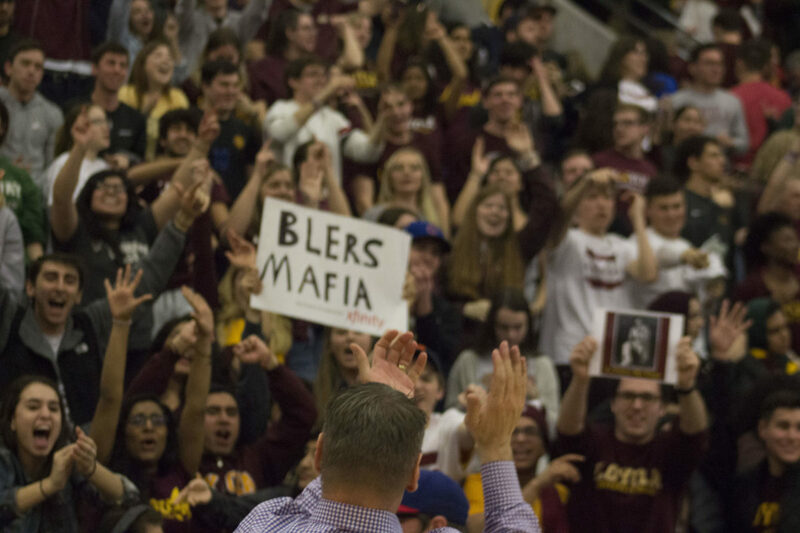 Loyola’s goals are clear and part of achieving those goals is a successful athletics program — regardless if students like it or not. Notre Dame wouldn’t be the brand name school it is today without its football program. Georgetown wouldn’t be one of the best Jesuit schools in the country without five Final Four appearances and NCAA tournament appearances in 2010, 2011, 2012, 2013 and 2015. Loyola’s men’s basketball program is starting to find success. 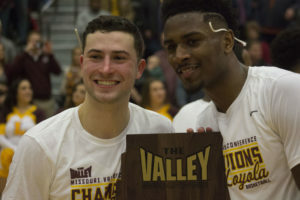 It just clinched its first conference regular season championship in more than 30 years and has the best chance to reach the NCAA tournament of any Missouri Valley Conference (MVC) team. The men’s team’s success comes at the same time the men’s volleyball team is No. 6 in the country and just beat the two-time defending national champions, The Ohio State University. This has matched up well with Loyola’s recent announcement it’ll build an $18.5 million practice facility for its men’s and women’s basketball and volleyball teams. Most of the money for the facility will come from a donation from Al Norville, according to school officials, but the school will foot some of the bill. Some students don’t like this decision and expressed their views with a protest during the men’s basketball team’s final home game of the season Feb. 24. Loyola knows success in athletics goes hand-in-hand with success as an institution. The men’s team’s good season this year means better recruits will decide to play for head coach Porter Moser. A brand new practice facility means Moser will be able to sell the school’s commitment and belief in its athletics programs. Better recruits and better teams mean the Ramblers have a better chance at making the NCAA tournament and there’s no better advertising for a school than an appearance in one of the greatest sporting spectacles this country has. March Madness averaged 10.4 million viewers per game in 2017. That’s 10.4 million people who might have never heard of your school before, and a portion of them are high school students and their parents who will soon have to decide where to go to college. In 2013, Florida Gulf Coast University made a wild run to the Sweet Sixteen. The following year, the school saw a 27.5 percent increase in applications. After former MVC team Wichita State University reached the Final Four in 2013, the school had a 30 percent increase in applications. Loyola has been trying to grow, with year after year of record-setting freshman classes, and the NCAA tournament bump in applications would help them continue this trend. When Butler University made the final four in 2010 and 2011, applications increased 40 percent and, according to the Washington Post, the national TV appearances and media buzz were worth $1 billion to the university. Trust me when I say Loyola saw what happened to Butler and took it to heart. Butler is a small, Christian school in the Midwest and now, because of basketball, it’s one of the most recognizable mid-majors in the country. Loyola is putting its eggs into a lot of baskets, and one of those baskets happens to be athletics. The investment will only help the school in the future. It might be fair to say Loyola has other causes it could be spending its money on. Maybe the school should pay adjunct professors more and maybe it needs to build a new dorm to fix its housing crisis, but investing in athletics will continue to bring Loyola closer to its aspirational peers. For current students, you might not think Loyola becoming a better school in the future doesn’t help you because you already received your education, but future employers won’t connect the time you went to school with when Loyola became a top-tier institution. All employers will know is Loyola is a great school and believe you got a top-tier education. Loyola becoming better in the future benefits us all and it can’t get better without athletics.